One price we liberals have had to pay for the Democrats' dreary electoral record over the last few decades is regular lectures about how we have failed and must rethink everything. I had hoped that, after the 2006 elections, the demands that we sweep away our calcified doctrine would come to a halt. (At least until the next Democratic electoral debacle.) But no. In the December 11 issue of The New Republic, Brink Lindsey of the Cato Institute argued that we are in dire need of a new ideological synthesis with the libertarian movement (see "Liberaltarians"). While his essay, written in a friendly spirit and with an uncharacteristically modest tone (by the standards of the liberals-must-rethink-everything genre, anyway), is quite thought-provoking, it ends up proving the opposite of what it intends. Lindsey thinks we need to become more libertarian. I say we should run screaming in the other direction. Lindsey begins with a raw political argument. The Democrats' newfound success, he maintains, depends upon the defections of libertarian voters. But, he continues, those defections have more to do with opposition to various Republican statist misdeeds than anything positive the Democrats have done. Therefore, he warns, "[I]f Democrats hope to continue appealing to libertarian-leaning voters, they are going to have to up their game." But, as Newt Gingrich learned to his dismay, support for smaller government as an abstract proposition almost never translates into opposition to government as it actually exists. The vast bulk of the federal budget is consumed by Medicare, Medicaid, Social Security, and defense--all of which enjoy solid public support. Yet Boaz and Kirby move seamlessly from the general to the specific. "Imagine a Democratic candidate who, say, supported private accounts for Social Security (as President Clinton considered doing in 1998), promised to cut wasteful programs, and actually defended civil liberties," they write. "He or she would surely build on Kerry's 38 percent support from libertarians." But only one-third of the public opposed the Patriot Act in 2004, and fewer still supported shifting money from guaranteed Social Security benefits into private accounts. Which brings us to the second conceptual problem with Lindsey's political strategy: It presupposes that any new libertarian voters the Democrats attracted could simply be added to their preexisting base. In reality, it would cost them support. Boaz and Kirby inadvertently demonstrate this very point. They stress that President Bush's share of the libertarian vote dropped precipitously between 2000 and 2004. But, during that time, Bush's total share of the vote rose by almost 3 percent. So, however many voters were turned off by the prescription-drug bill or the Patriot Act, many more were turned on. This demonstrates the obvious (to nonlibertarians, anyway) point that wooing a small bloc with unpopular views is not a sound political strategy. Likewise, if Democrats were to denounce psychiatry and quote endlessly from the works of L. Ron Hubbard, they could jack up their share of the Scientologist vote, but it probably wouldn't help their overall popularity. Lindsey's most interesting argument is that the greatest liberal triumphs of the postwar era have been libertarian ones. He maintains that desegregation and other progressive social movements have been enabled by economic liberalization. (The mechanization of housework has enabled feminism, for instance.) "[I]t has become increasingly clear that capitalism's relentless dynamism and wealth-creation--the institutional safeguarding of which lies at the heart of libertarian concerns--have been pushing U.S. society in a decidedly progressive direction," he writes. "Yet progressives remain stubbornly resistant to embracing capitalism, their great natural ally." Here, though, Lindsey betrays his incomprehension of liberalism. Socialists disdain capitalism. Liberals don't. And, if you want proof that liberal policies are compatible with economic dynamism, consider Lindsey's own examples. The economic dynamism that he credits with producing postwar social progress occurred primarily under--guess what?--liberal-style big government. In his attempt to demonstrate that liberals must abandon their statist ways to enable social progress, Lindsey has disproved his own case. When it comes to suggesting specifics, Lindsey's offerings do not bode well. A few areas of potential cooperation--such as tax reform and opposition to corporate welfare-- are well-taken. But those are issues where, essentially, policy wonks of all stripes agree. Venturing onto more ambitious turf, he proposes to essentially dismantle Social Security and Medicare, which together account for half of all domestic spending. ("We need to move from the current pay-as-you-go approach to a system in which private savings would provide primary funding for the costs of old age.") Lindsey's rationale here is not unfamiliar--since most people can anticipate their retirements, he argues, they should provide for them on their own. But liberals respond that people can't anticipate if they'll be retired for one year or 30, or how much they'll earn in their working years. Social Security eliminates those risks. And why would we force retirees into the individual medical insurance market? After all, we've tried that system with the working-aged population, and it has produced 45 million uninsured. Lindsey argues that these issues ought to be treated "as technical, empirical questions about what does and doesn't work, rather than as tests of ideological commitment," which is fair enough. Problem is, Lindsey doesn't just want to trim Social Security and Medicare or make them more efficient, goals liberals might support. He disagrees with their core mission. If I understand Lindsey, he is proposing the following bargain: Libertarians will give up their politically hopeless goal of eliminating two wildly popular social programs that represent the core of liberalism's domestic achievements. Liberals, in turn, will agree to simply eviscerate these programs, leaving perhaps some rump version targeted at the poorest of the poor. To be fair, Lindsey offers these ideas only as the basis for negotiation, but the prospects of bridging this gulf seem less than promising. In fact, the politically fertile terrain seems to lie in the anti-libertarian direction. 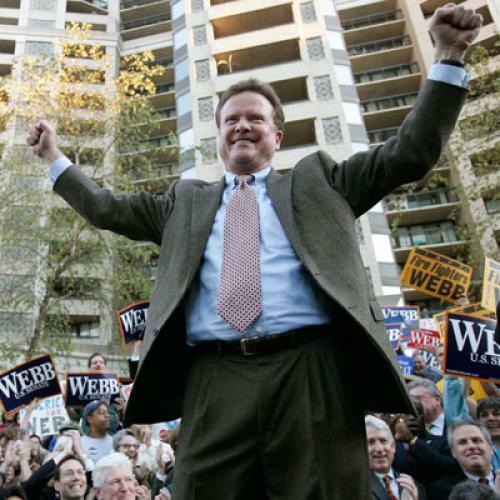 The most impressive Democratic performances in 2006 came from candidates like Bob Casey, James Webb, and Heath Shuler, who combined economic populism with social traditionalism. The ideological counterpart to this strategy would be to flesh out a kind of liberal-populist fusionism, rooted in fighting the ways that massive inequality and income fluctuation have undermined traditional family life. Am I saying that libertarians should just vote Republican? Not at all. As Lindsey notes, the libertarians' alliance with the GOP has mostly failed. They now have two electoral alternatives. One is to vote for social views they find abhorrent combined with debt-financed big government. The other is to vote for social views they find congenial combined with tax-financed big government. From a libertarian perspective, Democrats would clearly seem to be the lesser evil. They should vote Democratic because they have no better choice. I think the spirit of my proposed arrangement was best expressed by Michael Corleone, who said, "You can have my answer now if you like. My offer is this: nothing." I don't blame libertarians for wanting more than the lesser of two evils. But, when your beliefs are wildly unpopular, supporting the lesser of two evils is about the best you can expect.